Ever since a chance encounter at the Winnipeg Folk Festival back in 1998, Juno Award-winning singer-songwriter Stephen Fearing (Blackie and the Rodeo Kings) and Northern Irish troubadour Andy White (who has collaborated with the likes of Peter Gabriel and Sinead O'Connor) have been performing together as the folk-inspired blues duo Fearing & White. But even though the pair have been collaborating on-and-off for over a decade, only one recording has ever seen the light of day — 2011's independent self-titled debut. 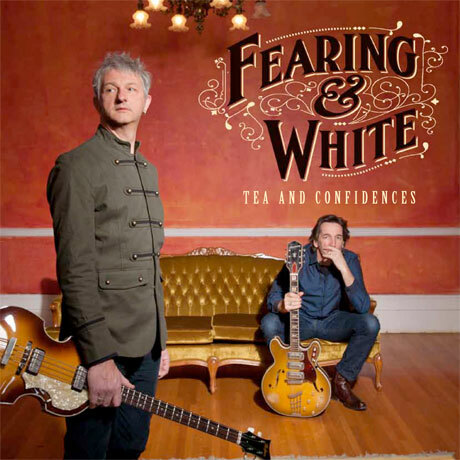 That's all about to change, as the duo's new full-length, Tea and Confidences, is set to be released on March 4. Stream the album ahead of its release on Exclaim.ca. Recorded over a string of intense writing sessions in Halifax, Vancouver and British Columbia's Salt Spring Island, Tea and Confidences finds the duo continuing on in their contemplative songwriting sound while exploring a deeper rhythmic territory, thanks in part to performances from veteran percussionist Gary Craig (Bruce Cockburn) and drummer Ray Faruggia (Junkhouse). Starting out with riff-heavy album opener "Tomorrow Takes a Long Time," the guitar-based two-piece trade classic blues licks ("We Came Together"), plaintive harmonies ("Save Yourself") and shuffling acoustic ballads ("This Isn't Hollywood," "To the Great Unknown") back and forth over the album's 11 dynamic tracks. Hear for yourself by listening to the album now in the player below, which can be found underneath the duo's upcoming spring tour itinerary.